Today is the memorial of Saint Jerome, 340-420 A.D. Both a scholarly world-traveler and a desert ascetic, he is perhaps best known for his work on the Latin translation of the Bible, the Vulgate. It began as a project to create a translation of the four Gospels using the best Greek texts. Already fluent in both Greek and Latin, he later expended great effort to learn spoken and written Hebrew from a Jewish convert to Christianity, and consulted with rabbis to ensure the accuracy of his translation of the Hebrew Old Testament. "To sum up, the Biblical knowledge of St. Jerome makes him rank first among ancient exegetes. In the first place, he was very careful as to the sources of his information. He required of the exegete a very extensive knowledge of sacred and profane history, and also of the linguistics and geography of Palestine. He never either categorically acknowledged or rejected the deuterocanonical books as part of the Canon of Scripture, and he repeatedly made use of them. On the inspiration, the existence of a spiritual meaning, and the freedom of the Bible from error, he holds the traditional doctrine." He was considered one of the original Four Doctors of the Church, and often appears in works of art with the others (St. Augustine, St. Ambrose, and St. Gregory the Great.) Hint: Jerome is the one in the red cardinal's robe and hat. Though the office of cardinal did not technically exist at that time, he held a prominent position in the court of Pope Damasus I who encouraged him to translate the scriptures. In other art he is shown studying in solitude, often wearing just a simple robe, with only a crucifix and skull in to meditate on. Sometimes he is shown with a lion, who, according to Jerome's medieval hagiography, befriended the saint after having a thorn removed from its paw. The Vulgate was the definitive edition of sacred scripture in the West for well over one thousand years, and was affirmed as the Church's official text at the Council of Trent in the 16th century. 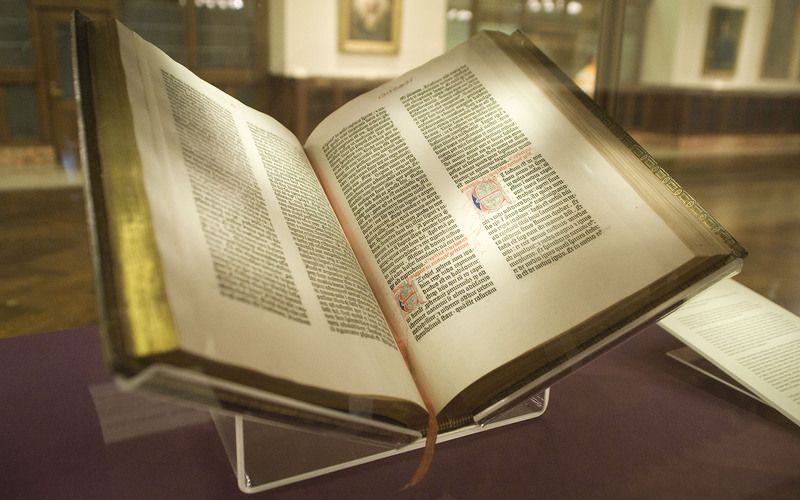 The Gutenberg Bible, the first moveable-type print edition of sacred scriptures, was a copy of the Latin Vulgate.